Today I celebrate four years without a stomach and my annual gastrectoanniversary blog. I’ve been MIA from the blogging scene over the past few months. Where have I been? I’ve been busy living. Honestly, my life is becoming so much more normal that I find it difficult to find unique gastrectomy topics to blog about these days. This past year I have been working on overcoming two ongoing issues since surgery – Fatigue and Sugar. About a year or so ago, I decided to man up and try sugary foods and various breads that I previously not digested well and surprisingly I could tolerate a lot more than what I had originally thought. I grew tired of being afraid of feeling unwell and that I didn’t want to live out the rest of my life missing out on things I may be able to tolerate but was too afraid to try. So in the safety of my own home, I started experimenting with various foods/beverages. Thankfully, I was able to tolerate a lot more than what I could tolerate a few years ago. So after four years, I can eat a small slice of whole grain toast with peanut butter for breakfast. I don’t pass on cake or pie. And I can eat a whole donut over 45 mins and not feel terrible. The key to my success is pacing and portion control. At this point, I will try anything and just pace through it and 85% of the time I’m fine. The other 15% I’ve passed out on the couch. I work a healthy 30 hours a week and have not bumped it up for the past three years. To those who may not know, I work as a physiotherapist in an orthopaedic clinic performing manual therapy on patients throughout my day. I’d classify it as a physical job. Twice a week I start work at 11am and I have been careful not to do anything too strenuous before work for fear I would burn out by the end of my work day. Well, earlier this year, I decided that I wanted to do more with my mornings and started pushing back my rise time and doing more with my mornings. I knew there would be an adjustment period where I would feel tired but my body would adapt and I’d even out. My good friend, coffee, would also be present to help me through. Currently, I am able to wake before 8 am with enough time to get some jobs accomplished before work. I’m working on pushing it back to 7:30 am to have a more consistent wake time throughout the week. It goes to show that if your mind is ready, your body will eventually figure it out. I require power naps every now and then but overall, my energy level has increased and I’ve gotten a lot more accomplished. As for my weight update, my weight remains fairly stable at 117-118lbs. Although I am only off of my pre-surgical weight by 7lbs, my body shape has changed. I’m leaner and carry my weight in different places. Reading through last year’s post, I’ve managed to maintain this weight throughout the year. I am beginning to think I’ve levelled out. The only issues is that my mind still thinks I am my old size and I constantly pull clothing sizes that are too large even four years later! I want to make a quick mention about the importance of iron supplementation and monitoring levels post total gastrectomy. My iron level has been slowly dropping over the past few years and for the first time this year, my iron was at a low enough level to affect me physically. It felt like I hadn’t slept for days. I just kept pushing through figuring it would pass but it did not and after a week and a half I caved and went to see my family doctor. She ran some blood work and I now know I need to take my iron supplement daily. Once I started taking it daily, my energy levels improved almost immediately. Previously, I was taking it every few days thinking that was good enough. Apparently not! From an unsuccessful IVF cycle, to a miscarriage, to facing your fears, this past year has been filled with many learning experiences that have helped me become more resilient and wiser. Year four has gotten me even closer to my pre-gastrectomy self and I believe this time next year I’ll be that much better. I love the Olympics – especially the Winter Olympics. Many of the sports carry considerable amount of physical risk, whether it be the laser sharp blades of the speed skaters, the speed zipping down a steep hill, flying stories above the ground, and of course sending yourself head first down an ice track on a small sled. I also love the stories of all the athletes as they have spent many years training for this moment when the world watches and cheers. Obviously, I follow and cheer a lot more for our Canadian athletes and last night I witnessed a truly inspirational story. 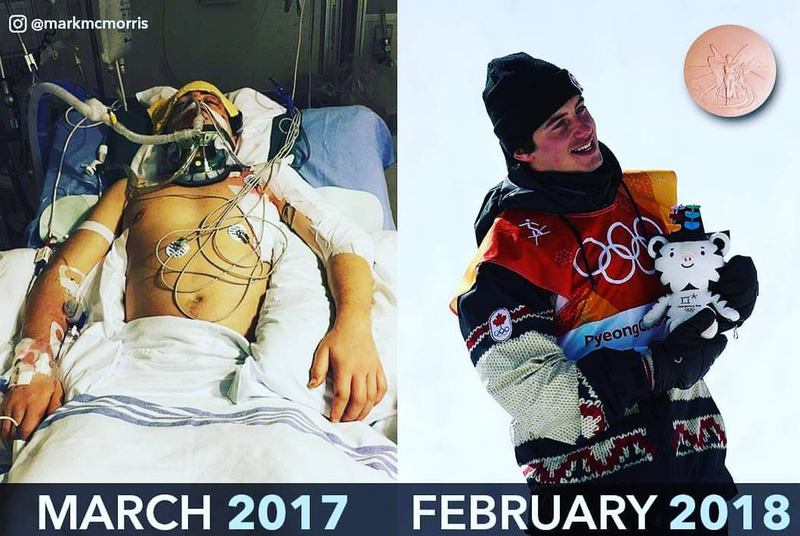 Last March Mark McMorris was seriously injured while snowboarding backcountry. He hit a tree and fractured his jaw, left arm, pelvis, multiple ribs, ruptured his spleen, and collapsed his left lung. It was shocking to the nation and many of us followed his story as he fought to recover. Fast forward to Pyeong Chang 2018. Just under one year later. Men’s slopestyle. Guess who’s back? Mark McMorris. He laid down three amazing runs to land him a second Olympic Bronze. Oh and did I mention he broke his femur in 2016 and has a rod in there? And then there’s Denny Morrison. He recovered from a bad motorcycle accident in 2015, suffered a stroke in 2016 and is back competing in long track speed skating. These stories are so inspirational as it demonstrates many things. Perseverance. Determination. Attitude. If they can overcome challenging life experiences, so can we.